The Lord, however sent Elijah to intercept the messengers on their way to Ekron, asking them if they seek Baalzebub’s advice because there is no God of Israel and instructing them to return home and inform their master that he shall not recover. In the Testament of Solomon (1st-3rd centuries CE), Solomon learns that Beelzeboul is one of the fallen angels who destroys by means of tyrants, causes demons to be worshiped, arouses desires in priests, brings about jealousies and murders, and instigates wars. The other demon he refers to as being imprisoned in the Red Sea is the one-winged demon, Abezethibou, Moses’ adversary in Egypt. Beelzeboul then prophecizes that the wind demon, Ephippas will bind the demon imprisoned in the Red Sea and bring him out of the abyss. He then tells Solomon that he is thwarted by the Almighty God and the oath “the Elo-i”. Another manuscript (MS P) of the passage found includes the numeric sum of the name of God. The letters translate as follows. E = 5, m = 40, m = 40, a = 1, n = 50, o = 70, u = 400, e = 8, l = 30. Finally, Beelzeboul informs Solomon about heavenly things. “Then Hell, receiving Satan the prince, with sore reproach said unto him: O prince of perdition and chief of destruction, Beelzebub, the scorn of the angels and spitting of the righteous why wouldest thou do this? Thou wouldest crucify the King of glory and at his decease didst promise us great spoils of his death: like a fool thou knewest not what thou didst. For behold now, this Jesus putteth to flight by the brightness of his majesty all the darkness of death, and hath broken the strong depths of the prisons, and let out the prisoners and loosed them that were bound. And all that were sighing in our torments do rejoice against us, and at their prayers our dominions are vanquished and our realms conquered, and now no nation of men feareth us any more. And beside this, the dead which were never wont to be proud triumph over us, and the captives which never could be joyful do threaten us. O prince Satan, father of all the wicked and ungodly and renegades wherefore wouldest thou do this? They that from the beginning until now have despaired of life and salvation-now is none of their wonted roarings heard, neither doth any groan from them sound in our ears, nor is there any sign of tears upon the face of any of them. O prince Satan, holder of the keys of hell, those thy riches which thou hadst gained by the tree of transgression and the losing of paradise, thou hast lost by the tree of the cross, and all thy gladness hath perished. When thou didst hang up Christ Jesus the King of glory thou wroughtest against thyself and against me. Henceforth thou shalt know what eternal torments and infinite pains thou art to suffer in my keeping for ever. 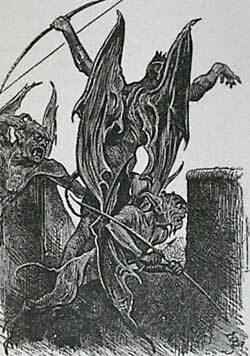 Belzebud: Also written frequently “Beelzebub”, “Baalzebub”, “Beelzebuth”, and “Beelzeboul”. From Hebrew, BOL, = Lord, and ZBVB,= Fly or Flies; Lord of Flies. Some derive the name from the Syriac “Beel d’Bobo,” = Master of Calumny, or nearly the same signification as the Greek word Diabolos, whence are derived the modern French and English “Diable” and “Devil”.